Witness to a murder. Kidnapped by a monster. Life hanging on a whim. Willow Armitage’s world was already falling apart; between getting fired and caring for her chronically ill father, she’s had little room for anything but survival. But that survival hangs in the balance the night she stumbles into a back alley – and watches a stranger die at the hands of the most beautiful man she’s ever seen. Lethal. Powerful. Unstable. Terrifying. The contract killer known only as Priest is a dangerous unknown, and when Willow wakes tied to a chair in his hideout, the only thing she sees in his fox-gold eyes is death. Yet for Priest, Willow is a dilemma: an innocent, a saint among the sinners he cuts down in the streets of Crow City. His code of honor forbids shedding innocent blood. Releasing her will send her straight to the police. The only answer is a warped game, and his promise: that he will find the darkness inside her, expose it, and prove that deep down, everyone is just as monstrous as he…and just as worthy of death. Yet he unearths not a monster, but a smoldering and secret desire – one that has always terrified Willow, and may be her undoing. His touch sets her alight. His strength burns through her like flame. And his control melts her each time he binds her virgin body, possesses her, teaches her the strength in weakness and the passion in submission. But that passion may be her damnation, and in the end Willow must choose: Priest’s love, or her own life. When his every kiss is pure sin…can she resist damnation long enough for Priest to find his way to redemption? TRIGGER WARNING 18+: This story contains content centered around non-consent, bodily autonomy, sexual assault, bodily functions, and violence. Please focus on self-care above all, and don’t be afraid to put the book down if you need to in order to protect yourself. You come first, always. 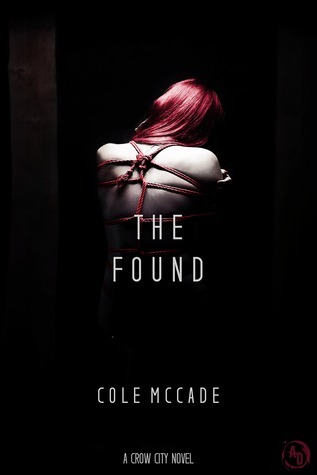 The Found, #2 in The Crow City Series, is a thoroughly intense and addictive read. I was captivated by the unfolding story of the contract killer Priest and Willow his captive, a story which examines dark and disturbing themes including non consent, violence and sexual assault. If you are at all likely to be distressed by any of these issues you may wish to give this book a miss – and I do not say this lightly. Cole McCade is a new author for me and I will most definitely be reading more of his book! The book can be read as a standalone, although the main character of Priest, the hero (or should I say anti-hero) does feature in the other books in the series. The book is one of the darkest novels that I have read and boy was it one hell of an amazing ride! Both the hero and the heroine are broken before they meet: Willow, a long time carer to her father has been scarred on account of traumatic childhood relationships, and Priest due to his horrific experiences as a prisoner of war (experiences which we gain a glimpse of in this book). I do not want to reveal more about their respective pasts, as finding out about what makes the main characters tick is part of the joy of reading – suffice to say that Willow believes that sexual contact is dirty and that prior to her abduction by Priest she felt that her life was at an all time low. The book contains some accounts of Willow as she is growing up and we are given an insight into her psyche and what has made her what she is today. As to Priest, his coping mechanism is to dedicate his life to killing those who he views as scourges on society – the paedophiles, drug dealers and abusers. A hired killer he prides himself on ensuring that his targets are deserving of his attention before he takes on the hit. The book contains violent and graphic scenes, any of them sexual and as I said is not for the faint hearted. When Willow inadvertently witnesses Priest’s latest kill, he kidnaps her and takes her to his hideout. He is in a quandary as self preservation dictates that he should he kill her to avoid leaving loose ends. However, his personal code baulks at destroying an innocent – yet just how innocent is Willow? Priest decides to find out as such as he can about his captive, probing into her life and psychology to decide whether or not she deserves to die. Much of the read is chilling. Willow’s terror at being abducted by Priest is palpable and I really felt for her. Slowly Willow, the captive and Priest, the killer, form a connection, a connection that becomes more and more intense, physical and sexual. Ironically Willow finds that her captivity allows her to find inner strength that she did not know she had, facing up to her past and what she is capable of. Her captivity and the fact that Priest could decide to extinguish her life at any point gives her the freedom to act as never before – after all what does she have to lose? The read really is a tour de force for fans of dark reads and dark romance. Highly recommended.